Acupuncture is often used as an adjunct to your physiotherapy treatment as it can treat pain and reduce inflammation. Acupuncture is particularly useful in the treatment of lower back pain and neck pain. Acupuncture is an ancient Chinese medicine and has been credited as scientifically useful in the treatment of pain. 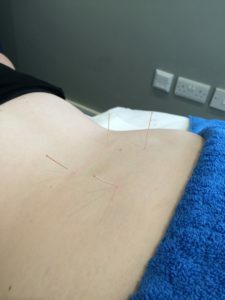 Modern science has actually found that the needles stimulate blood flow to the area that is being needled which in turn helps to remove waste products from the muscle, improve oxygen flow to the muscles and in turn encourage healing. The needles stimulate the pain centre in the brain to encourage the body to produce it’s own natural pain relieving chemicals endorphins. The Chinese philosophy of acupuncture is that “Chi” or energy travels around the healthy body. This energy can become blocked when there is dysfunction or disease, the acupuncture is said to improve the flow of this to restore the Yin and Yang in the body. Andy is accredited by the Acupuncture Association of Chartered Physiotherapists.